THE CITIZEN ROSEBUD: Jack of All Shades? When you need to sport some attitude, you put on your shades. Just like Jack. Thank you lovely peeps, for all your blog and Facebook comments, emails, and tweets regarding our challenge to showcase beauty/style in all flavors! I am so grateful to be a part of medium that can REALLY make a positive impact on our culture, and I'm thankful to all of you! We are making lemonade friends, so lets enjoy the fruits of our labors. Fashion can be a way for you to express your personality. Your expression of style can make the world a more beautiful place. Variety is spice for life, so dress up, doll up, get up and enjoy your flavor! We all win, when we take time to appreciate the diverse expressions of beauty. the ONE, ONLY, and the very lovely Clare of Miss Simmonds Says. I can't imagine a better winner of those cool Polaroid shades, so congrats to you dear Clare, and thank you Sunglasses Shop for sponsoring the give-away! Love those shades, Bella! You're a STAR. Damn, I'm not a winner. Oh, well, next time. 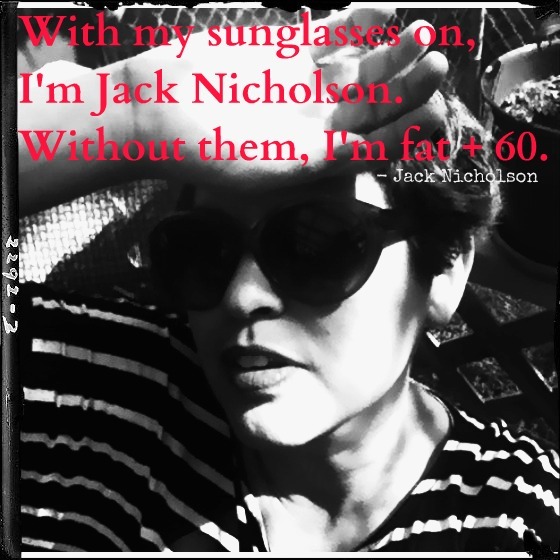 Hahaha,I frequently use shades for the same reason as Jack,only I'm not 60...!!! Fab words,my darling,and how fab for calre to be a winner!She'll be very excited! YaY! Just in time for her birthday too. She'll certainly rock these! I'm so happy that Clare won this amazing prize! Glasses are girl's best friend! Bella, you are such a talented writer and state things so well! Keep fighting the good fights! You are the best! Indeed. I believe sunnies give everyone a self-esteem boost. They're also great for those times when you're out and you want to say "Leave me alone, I'm busy." in a nice way. I'll have a lemonade post up tomorrow! Congrats to the winner! Gotta love Jack, right?! Shades are very much needed this side of the pond, as it's sunny all the time! Not complaining though, gimme attitude any day and for some extra va va voom, a dash of red lippy! Everything about you and your blog is admirable. You're fighting the good fight for those of us who are different. Keep it up, buddy! How the hell did I miss this gran give away?